Valeria Bubble Sleeve Tunic Just $25! Was $50! PLUS FREE Shipping! 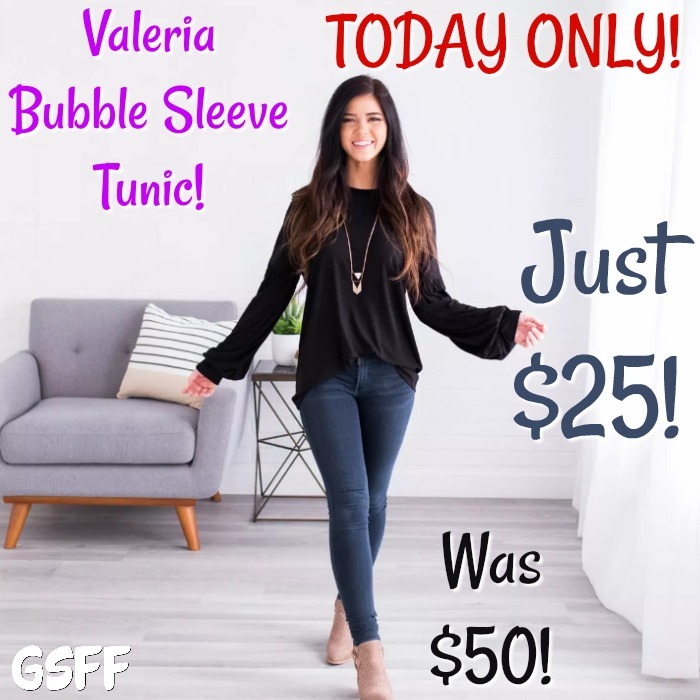 You are here: Home / Great Deals / Black Friday Deals / Valeria Bubble Sleeve Tunic Just $25! Was $50! PLUS FREE Shipping! This is so cute and looks completely comfy! This Valeria Bubble Sleeve Tunic is Just $25! Was $50! PLUS FREE Shipping! We are head over heels in love with our new Valeria Bubble Sleeve Tunic! From the bubbled sleeves and cinched cuffs to the trendy scoop neck, how can you resist? Our tunic is so cozy and soft, with a semi-loose fit, our tunic is a must-have in every woman’s closet! Available in a good selection of classic color choices, you’re sure to love the way you look and feel in our tunic!